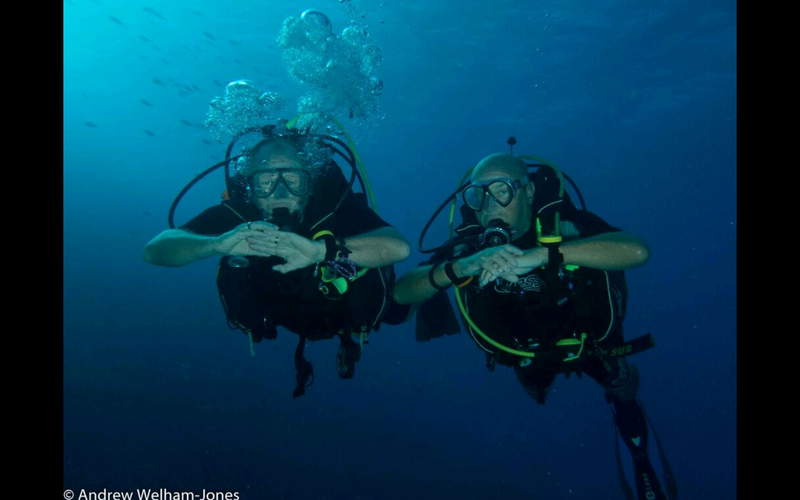 This year’s expedition was in Egypt, travelling to various sites across the Red Sea. I have done this expedition previously so was excited to do it again. The flight in felt like it took longer than it should have done, with screaming kids commenting every minute on what the plane was doing and with very little air conditioning, it was far from comfortable but we finally landed in Hurghada and in good spirits. 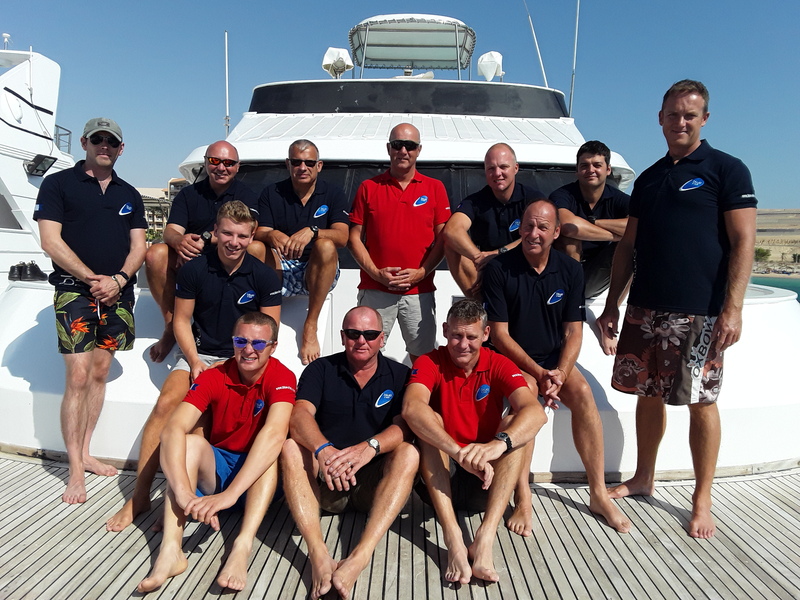 We made our way to the liveaboard, the Red Sea Adventurer, for briefings and kip. Liveaboards allow divers to explore areas beyond the reach of dive resorts, transporting you to a variety of diving destinations. The team on board worked really hard to get us from site to site and keep us safe, fed and watered throughout. Each dive started with a brief from our guide Abdu, who was very knowledgeable of the different areas. He gave us detailed descriptions of each area and the history behind it, where best to enter wrecks and what marine life we could look forward to seeing. The first day of diving began with a shakeout dive, at the Poseidon site, making sure every diver was happy in themselves and their equipment. 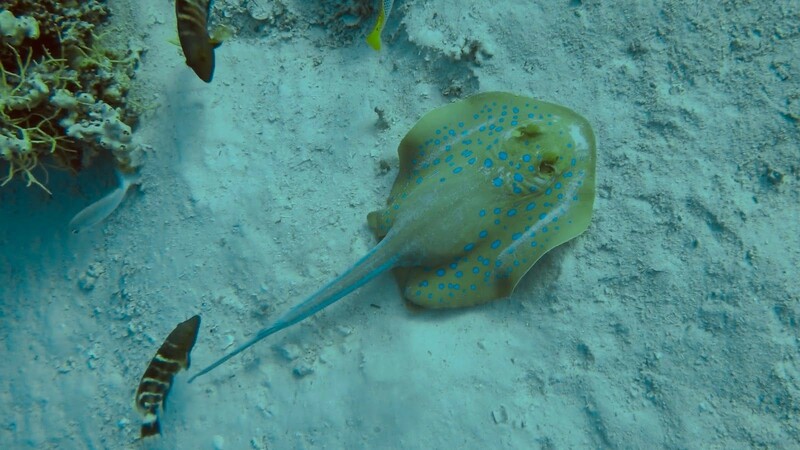 The sighting of a Bluespotted Stingray set the tone for this expedition. 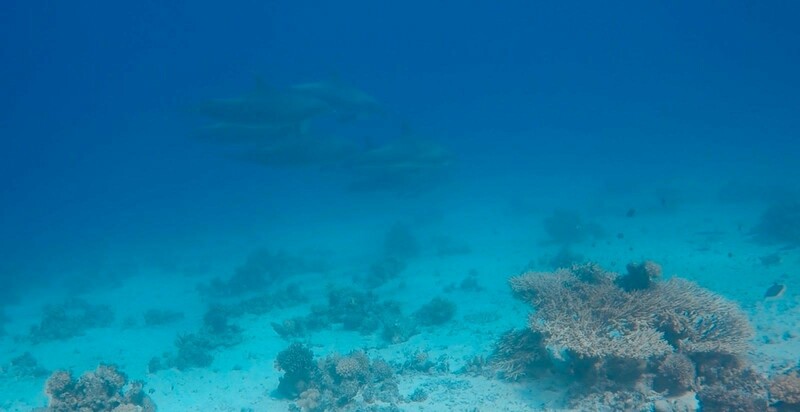 As we moved to the next site, Small Gubal (the barge), we were accompanied by dolphins swimming around the liveaboard as we moored up to the reef. 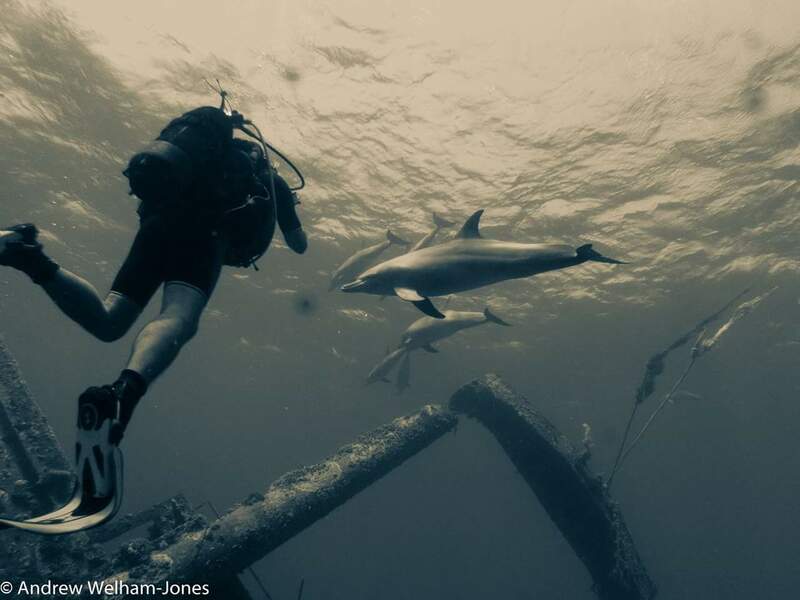 We were very eager to get in the water and experience a dive with these graceful creatures. By the second wave of divers they had sadly disappeared, so our experience of them was merely above water. The Barge is a small wreck which is home to many. 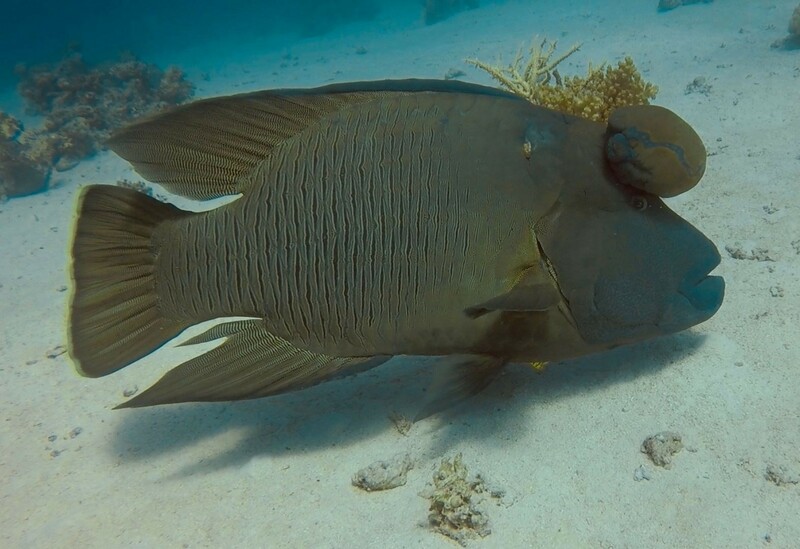 We came across crocodile fish, stonefish and much of the regular fish you’d usually see like batfish. We stayed at the Barge for the night dive too. The sight was amazing. 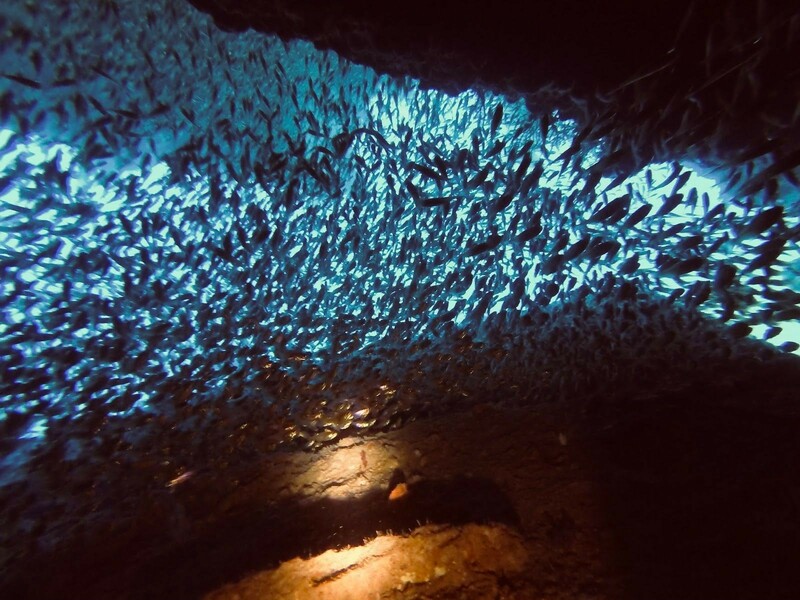 A Trevally zipping around us, hunting through the coral as other sea life created formations on the seascape reminiscent of Starlings in the sky. A shaky start to the day, as a couple of people on board found their bowels swaying with the motion of the sea, you could imagine what happened next. 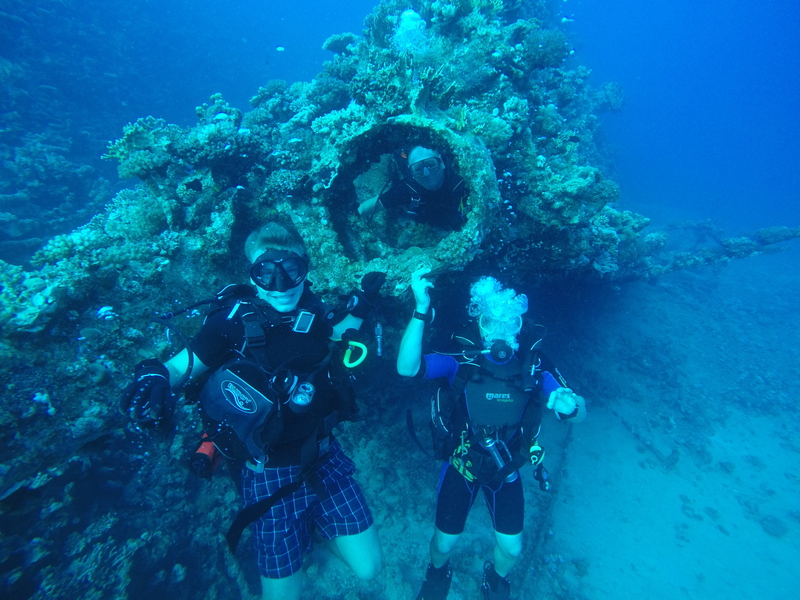 As the rough journey came to an end we found ourselves moored up to the legendary wreck of the SS Thistlegorm. 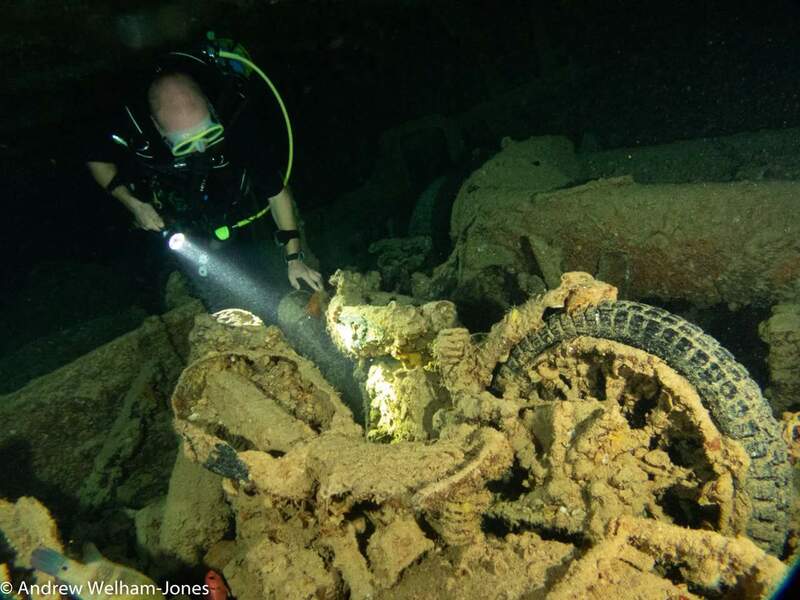 We spent all day at the SS Thistlegorm site, diving the wreck and exploring it’s cargo. 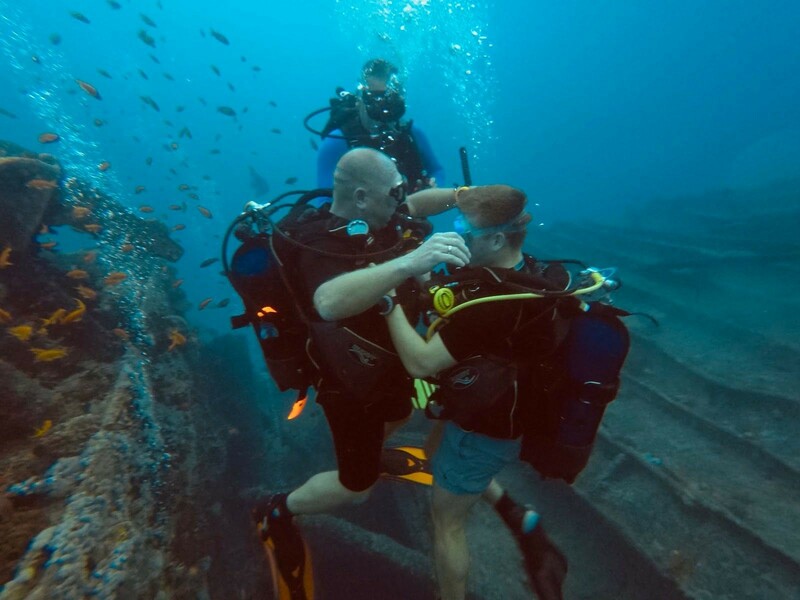 We did three dives on site, both day and night dives on the same wreck. The day dives gave us time to get familiar with her layout and cargo, we explored as much as we could before our air ran low. With her impressive haul of Bedford trucks, motorcycles, the boxes of Lee Enfield rifles and locomotives really put her size into perspective. The night dive was eerily quiet with lots of sea life to see. Her cargo stuck in time, preserved by the sea, looking very ghost like. The silence was abruptly interrupted by three large bangs, that sounded like explosions, within inches of our ears a large metal pole crashing against the ship. We moved off from the SS Thistlegorm site in search for another, and we moored up to the Dunraven wreck which we explored in and out. We saw another Bluespotted Stingray as we approached the wreck and swam through hundreds of glass fish as we explored the wreck. We came out the other side and started floating along the reef wall. The wall was much more interesting with a lot more marine life. 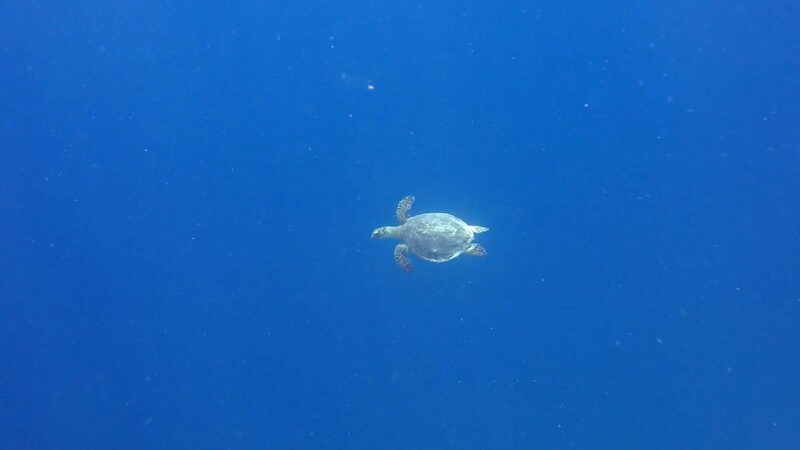 As we started to ascend towards the safety stop, a turtle swam underneath us, we contemplated going back down but it was too late so had to watch from a distance. 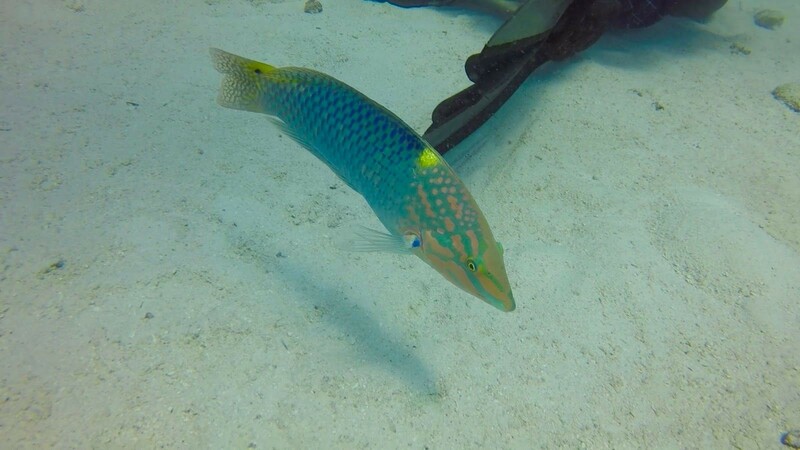 Exploring the reef we could see numerous different varieties of fish including Bat fish and Porcupine fish. In the usual style the officers got lost and ended up surfacing at the wrong boat, the crew had to send out a Zodiac to retrieve them, much to everyone’s amusement. Our third and final dive for the day is at The Alternatives. Bit of a standard dive, coral on a bit of a pinnacle rock. Lots of sea life though, we managed to turn it into an, unintentional, exploratory drift dive. I missed the early morning dive due to number restriction but it wasn’t without amusement. 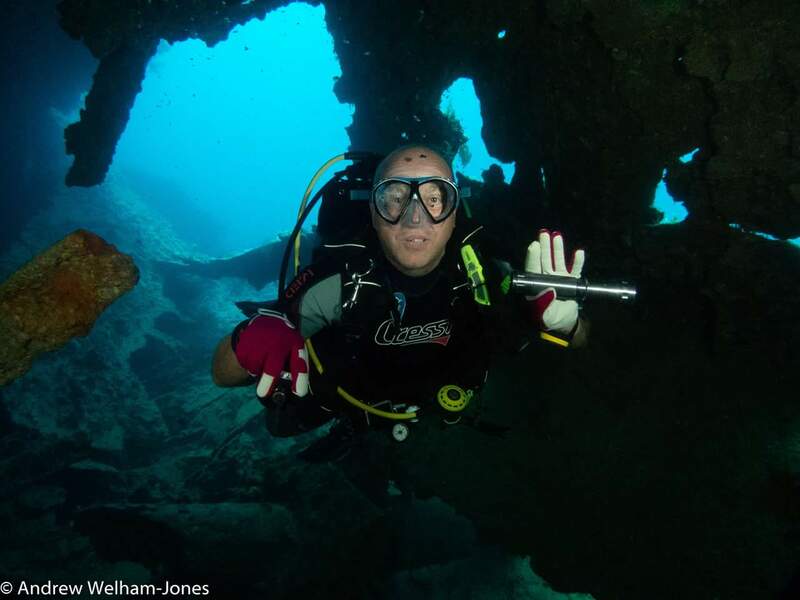 As the first dive came in one of our instructors lost grip of his DSMB reel on the surface and as he was trying to retrieve it unraveled more and more, his line wrapped around him as he was frantically trying to pull it up without anyone noticing. A perfect demonstration of what not to do. He never lived it down. 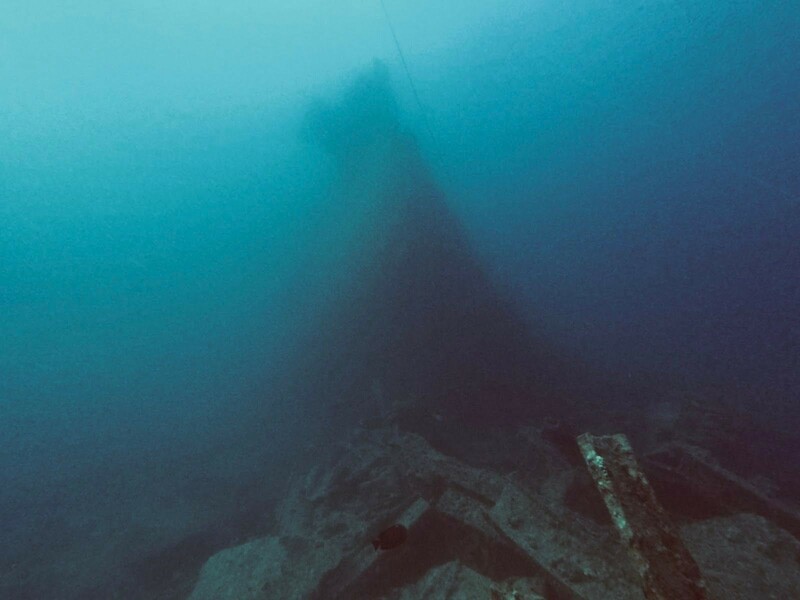 My dive on the Yolanda wreck started out with a bit of a drift, the current was strong with this site. When we reached the Yolanda, we saw the spilled cargo of toilets and baths then broke away from the main group and carried on with the current, I’m glad we did because a small turtle came out of nowhere and swam right past us. 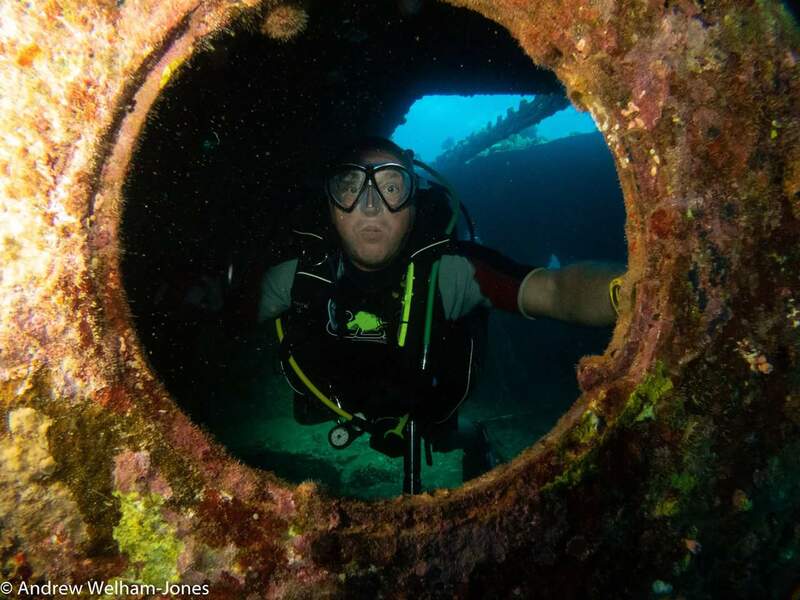 My next dive was on the Chrisoula K, we explored every inch of this wreck getting through some tight squeezes. Our night dive was a standard reef dive at Sha’ab Abu Nuhas but still had some impressive sights, there was a huge Moray eel which curled through the coral protecting its young. 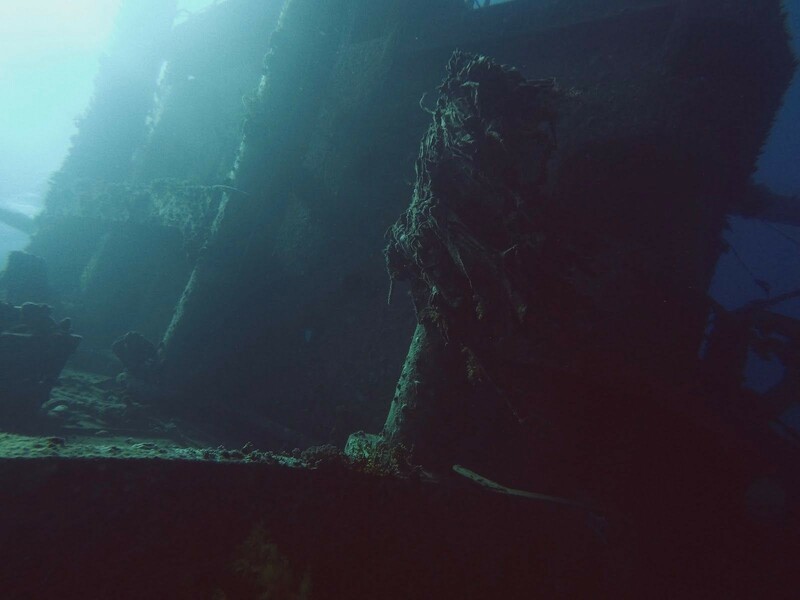 We started the day off with a pretty standard wreck dive on the Carnatic, the engine area had been completely ruined so there was only really the bow and the stern to explore. The Hull was pretty much covered in coral and the sea life that goes with it, including a sea cucumber which was curled up resting. 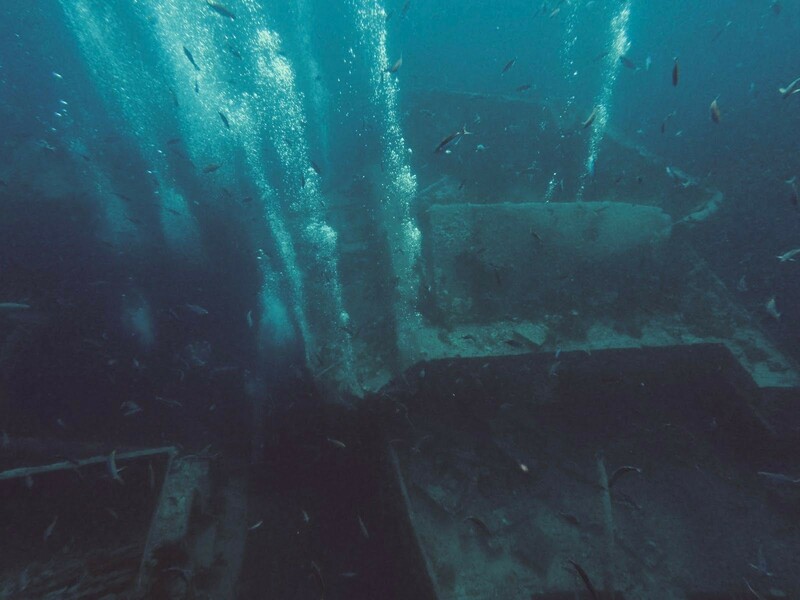 Our next dive on the Ghiannis D was a little more interesting, it had been sank on a 45 degree angle so as we finned through the bridge and engine room we found it very disorientating, with walls turning into ceilings and floors being walls. The old engines letting air escape sounded like they were running, the whole wreck was amazing and yet a little uncomfortable. 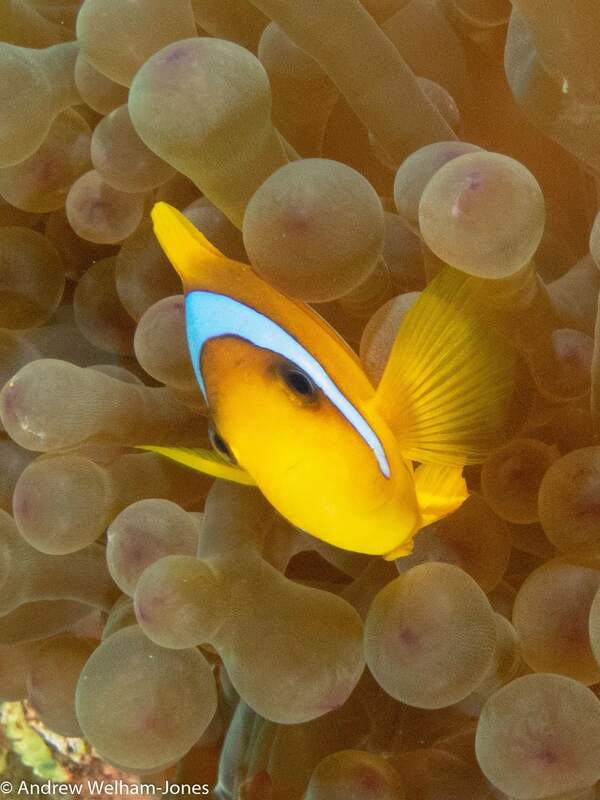 Our final dive for the day was on the reef Siyoul Keber. It was a nice, relaxed bimble. Concentrating mainly on the marine life and taking photos of what ever took our fancy. Much like the rest of the expedition there was Moray Eels, Scorpion Fish, Puffer Fish, Batfish, Sea Cucumbers, Clownfish and so much more. It was a fantastic finish to the day. 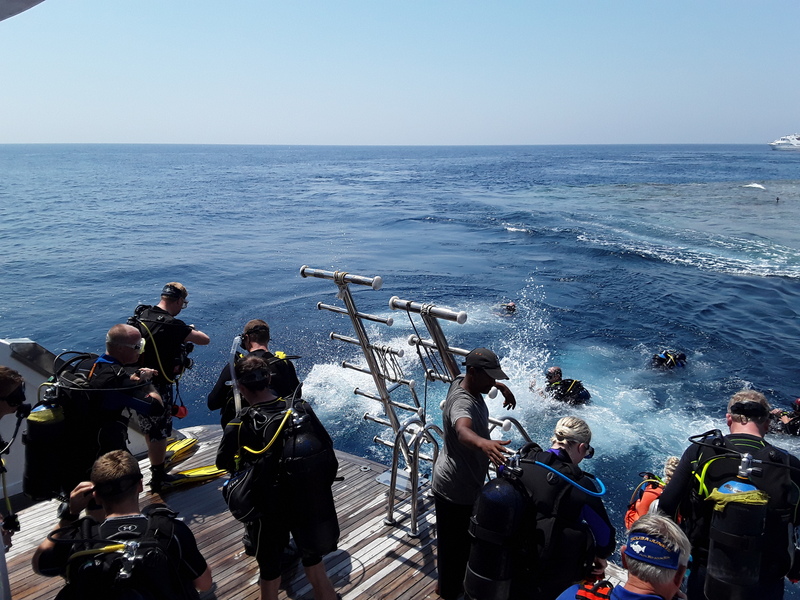 The morning dive of our last day was uneventful, nothing much came out to see us so swam around the corals for most of it and as with most infanteers sat waiting, at the bottom of the red sea playing with a friendly fish, for the next timing. Our second dive on the other hand was much more exciting seeing a school of eight dolphins and a huge, possibly around 1.4 meters in length, Napoleon Wrasse. We left the liveaboard and made our way to a nearby hotel, the Marriot, where we took a dip in the pool and had some lunch before departing back to the UK. The final and welcomed surprise of the trip was being upgraded to first class for the journey home. All in all, another excellent expedition to the Red Sea. Lots of sea life and wrecks to explore and a predominantly Yorkshire boat which made for good company to be in and endless amounts of tea. Those that were in training, completed all their tests and assessments to gain the Sports Diver qualification and I completed enough dives to gain my Dive Leader qualification.